Who else is super pumped for spring? I love seeing everything come back to life this time of year. Between the beautiful blooms, the crisp air and the warm sunshine, it instantly puts me in the mood for light and refreshing meals. These Spring Farro Bowls fit the bill. They’re made with lightly steamed spring vegetables and drizzled with a tangy lemon tahini dressing that will keep you coming back for more. 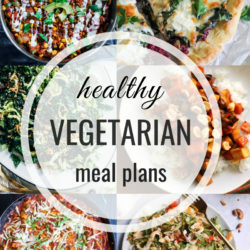 I used a combination of seasonal vegetables that I was able to find near me but feel free to change things up with what you have available to you. Arugula creates a light the base for the bowls and offers up a mild peppery flavor. If you’re not a fan romaine or spinach would also work great in it’s place. Asparagus is the epitome of spring so it only seemed right to include it. Lightly steaming the asparagus leaves it’s crisp enough so that it’s not stringy but still soft enough to chew. Just make sure you keep a close watch while you’re steaming it because it can get overcooked quickly! If you can find fresh peas I highly recommend using those but frozen and defrosted will also work fine. 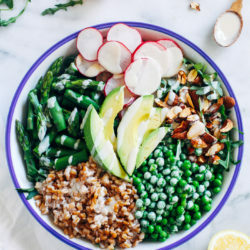 Farro is our main source of protein and fiber, and also adds a delightful nutty flavor and chewy texture to the bowls. It’s an ancient mediterranean grain which means it tends to be lower in gluten than modernized wheat. My favorite brand is Bob’s Red Mill because it’s certified organic and I can always find it at my local grocery store. 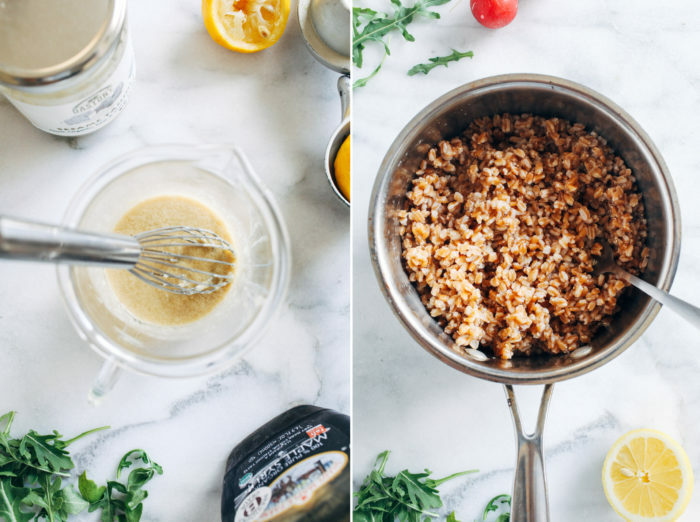 If you use the quick cooking method and soak the farro overnight (which also helps digestibility and nutrient absorption) then it only takes 10-minutes to prep. Quinoa or brown rice also makes a great gluten-free alternative for allergies. Sliced radishes provide a nice light crunch to the bowls while also offering a punch of vitamin C.
Adding even more texture, chopped roasted almonds add a healthy dose of vitamin E.
Top it off with sliced avocado because everything is better with avocado. Lemon tahini dressing brings it all together thanks to it’s creamy texture and tangy flavor. It’s also packed full healthy fats and amino acids, rounding out the bowls as a wholesome meal. Start by prepping the dressing: whisk tahini with lemon juice and a touch of pure maple syrup and fine sea salt. Add water as needed to thin. Cook the farro: drain the excess water it’s been soaking in overnight then rinse thoroughly. Add to a pot with fresh water, bring to a boil and cook for about 10 minutes, or until soft. Steam the asparagus: Using a steamer basket, bring the pot of water to a boil and place the asparagus in the basket. Cook for 3 to 4 minutes, just until asparagus is slightly tender but still firm and green. Rinse with cold water then chop into bite-size pieces. Layer the bowls: add the arugula, asparagus, peas, radishes, almonds and avocado to the bowls. Drizzle with lemon tahini and serve or store in containers for later. 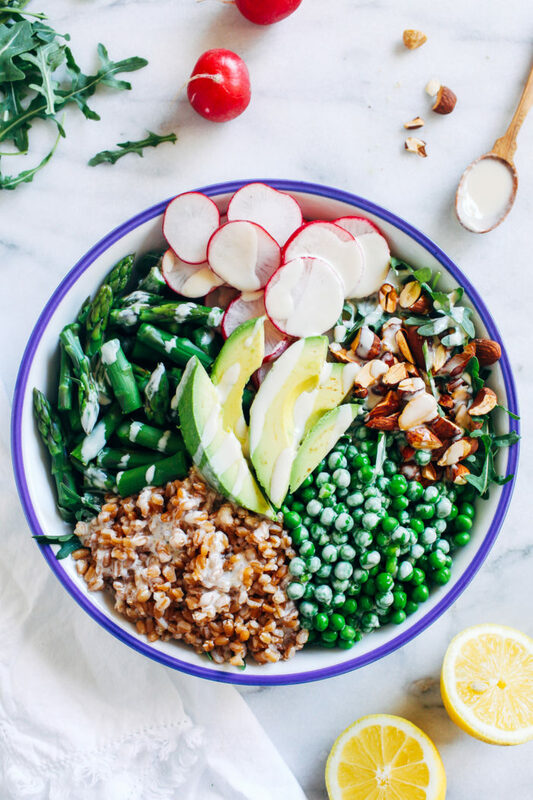 Whether you’re looking for a light and healthy option to prep for lunches during the week, and easy dinner idea, or something to serve for a spring gathering, I’m sure these farro bowls will be a hit. Enjoy! 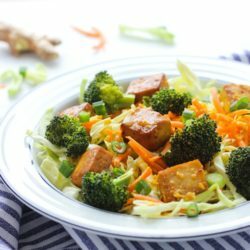 Looking for more bowl recipes? Prep the dressing: In a measuring cup or small bowl, combine all of the ingredients for the dressing. Whisk until smooth. Add water a tablespoon at a time as needed to thin or more salt/sweetener as desired. Set aside. Cook the farro: Drain and rinse the farro then transfer to a medium size pot with 2 cups of water. Bring to a boil and cook for 10 to 15 minutes. Cover and steam for another 5 minutes, until farro is soft and all of the water has absorbed. Set aside to cool. Steam the asparagus: Using a steamer basket, bring a pot of water to a boil then place the asparagus inside of the basket. Cover and steam for 4-5 minutes, just until slightly tender but still green and firm. Remove from heat and rinse with cold water. Transfer to a cutting board then cut the asparagus into bite-size pieces. 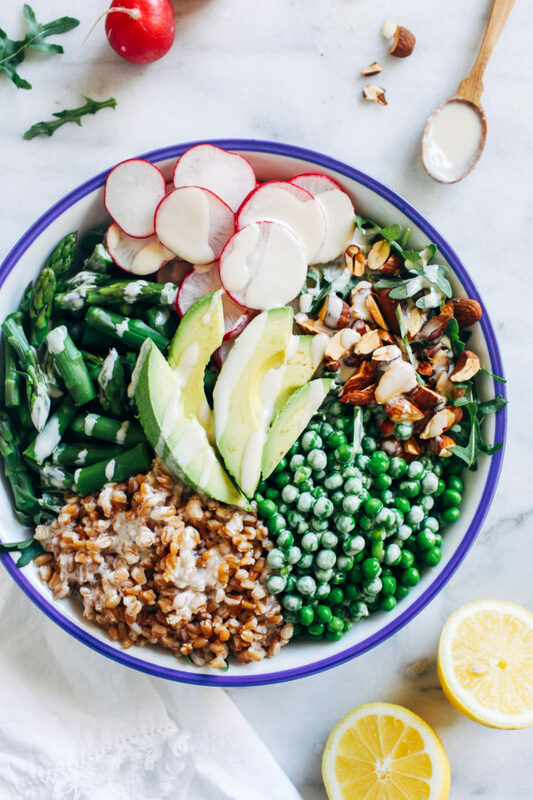 Assemble the bowls: Start by layering the arugula on the bottom then add the steamed asparagus, peas, cooked farro, radishes, avocado and almonds on top. 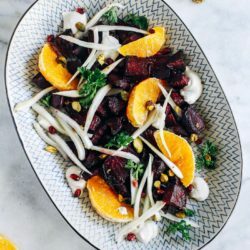 Drizzle with lemon tahini dressing, serve, and enjoy! If preparing in advance, store the dressing separately until ready to serve. 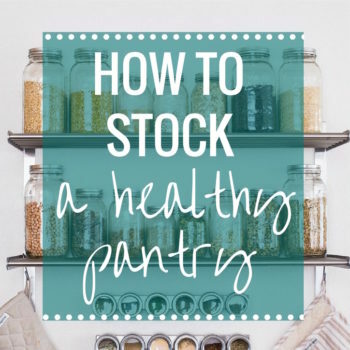 The bowls and dressing should keep for up to 4 days when stored in sealed containers in the refrigerator. The recipe serves 2 to 4, depending on how much food you eat in one sitting. The nutrition facts are for the entire recipe. If it makes you 2 servings then divide the nutrition facts by 2, and for 4 servings divide the facts by 4. Farro has quickly become my new favorite grain, I just love how nutty and chewy it is! And that lemon tahini sounds incredible! 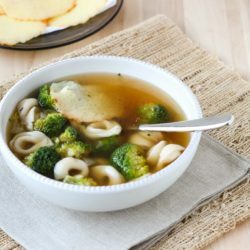 What a lovely spring dish!! 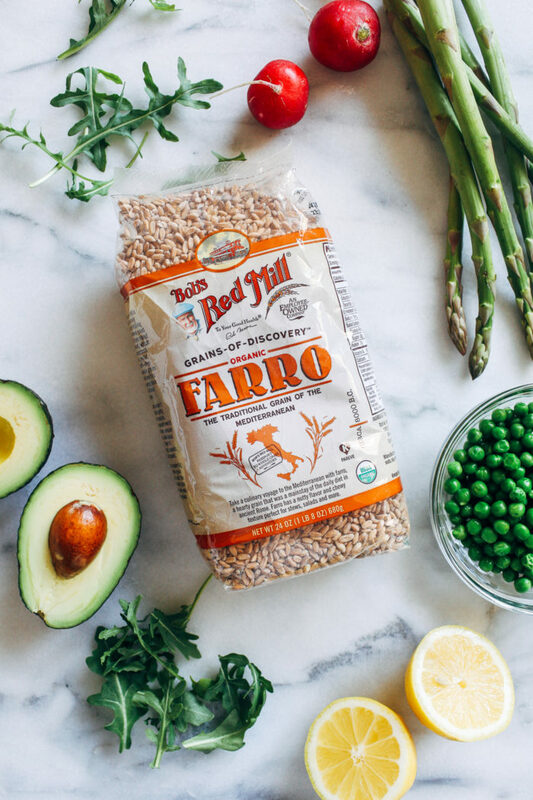 I actually have done a lot of cooking with farro but I hear it’s delish and by the looks of this recipe, I am totally on board. I have to also say, your photos of this are all so beautiful!! I love the pictures you took of the different steps. 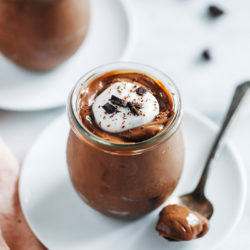 I really have to try this recipe! Farro is my favorite grain — I love that nutty flavor and chewy texture. There’s nothing better than combining it with all this beautiful spring produce and that lemony tahini dressing. I’m craving one of these beautiful bowls! 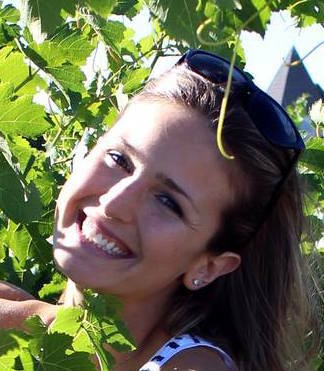 Me, me! I’m pumped for spring too! :) I feel like I moved to New England and the weather immediately started sucking haha so I want to explore some new-to-me states this spring and summer! I love farro, and these bowls are so bright and beautiful! That changing bowl photo is awesome – What did you use to create that? So cool! I don’t mind hibernation mode during winter, but I gotta say I’m looking forward the warmer temps and longer days. This bowl is a fabulous culmination of flavors and texture and I absolutely love the addition of steamed asparagus! Farro is on my menu again – I love it’s nutty flavor and chewy texture. And, it’s Bob’s! What’s not to love! Slather tahini on everything I say! Delicious work, Sarah!